With the weather gods smiling on farmers, the state recorded bumper Rabi and Kharif crops during 2012, but fruit growers were not so fortunate and had to contend with a moderate-to-lean outturn of apple. 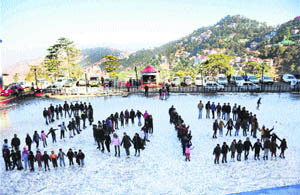 With the expectations of snowfall, a large number of tourists are thronging the town to celebrate the New Year. After the recent snowfall in the entire upper Manali region, the daytime weather is pleasant, while mornings and evenings are chilly. Eyebrows have been raised over the escalation in cost of the Dhola-Sidh power project by about Rs 100 crore in a short span of time. 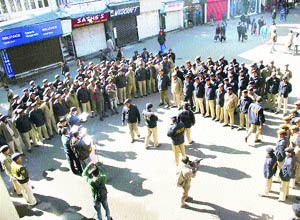 Policemen on duty ahead of New Year Eve celebrations at the Mall in Shimla on Sunday. Losing the Arki seat due to the presence of rebels has become almost a tradition with the Congress, which has lost the seat twice consecutively. “All BJP workers should now remain ready for the next Lok Sabha elections that would fall sooner than due and we should be prepared to accept this as a challenge,” said BJP MLA Randhir Sharma while addressing a large number of supporters from the Naina Devi constituency at the ‘Aabhaar Milan’ (thanksgiving) programme organised at the Dholera temple complex here last evening. The Union Ministry of Human Resource Development has released about Rs 3.63 crore as the third instalment for the Saakshar Bharat Mission in the district by the Zila Saaksharta Samiti (ZSS). With an overall slowdown in the economy, the industry in the state too felt the impact of low productivity and shrinking trade margins this year. With snow eluding the “Queen of Hills” on Christmas and the weather god in no mood to oblige the winter revellers with a white New Year, there is a moderate rush of tourists compared to the past year. Newly elected Nurpur legislator Ajay Mahajan, who is also the state Congress general secretary, listed his priorities for the development of his constituency while talking to mediapersons at the Congress office here today. Residents of the remote Kalahn area in the Bharmour tribal subdivision have urged the government to strengthen the electricity transmission lines in the area to check the issue of hanging wires. The Himachal Pradesh Grith-Bhati-Chahang Sabha, representing Other Backward Classes (OBCs) in the state, has been resenting non-representation in the newly formed Virbhadra Singh Cabinet. 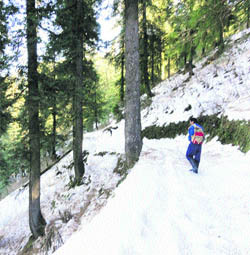 A view of fresh snow on the higher reaches of the Kalatop-Khajjiar wildlife sanctuary. The Indian National Trade Union Congress (INTUC) has sought a thorough probe into the construction activities of the Chanju-I hydroelectric project, the construction of which is going on in the Churah subdivision of Chamba district. Local residents found a body floating in the Gobind Sagar near Manjhasu village today. They immediately informed the police, which arrived on the spot and took the body out with their help. Rajinder Dogra was elected chairman of the Bar Council of Himachal Pradesh today. He defeated Sandeepan Sharma by three votes. The Rabi production of 6.78 lakh tonne was the highest ever, surpassing the previous high of 6.75 lakh tonne achieved last year. Wheat was the main contributor with an output of 6.15 lakh tonne. The monsoon was delayed but adequate rains towards the end of July and throughout August made up for the deficiency in the first half of the season. Consequently, the state had a record Kharif crop. As per advance estimates, production is likely to be 8.90 lakh tonne, which is 20,000 tonne more than last year’s record output of 8.70 lakh tonne. The production of maize has increased to 7.50 lakh tonne from 7.15 lakh last year. It will be for the first time that the target for the season, 8.87 lakh tonne, will be exceeded. Thus, the state is set to record the fifth consecutive bumper crop. More importantly, the year ended on a good note with timely rain during the current month raising hope of good Rabi crop. Weather plays an important role as only 21 per cent of the cultivable land has assured irrigation the rest of the area is rainfed. The weather gods disappointed apple growers for the second consecutive year. Extreme cold conditions during flowering in the mid-hills, which accounts for 70 per cent of the crop, affected fruit setting and the dry spell which followed caused heavy premature dropping of fruit. As a result, the crop was moderate and the production failed to cross 2 crore boxes, though it was slightly better than last year, when the crop completely failed and the state produced only 1.37 crore boxes. However, it is below normal and almost 55 per cent less than the record production of 4.46 crore boxes, achieved in 2010. However, a redeeming feature was that the market remained high throughout the season, which made up for the lack of production and the returns were good. The state continued to do well in the field of cash crops, with vegetable production set to touch 13.50 lakh tonne during the current financial year. The target of 8 lakh tonne during the Kharif season has been achieved. With weather gods obliging farmers with timely rain, the target of 5.5 lakh for the current Rabi season is likely to be achieved for the first time. Emphasis on organic farming continued during the year and more farmers were registered, taking the total number of organic farmers to over 26,000. 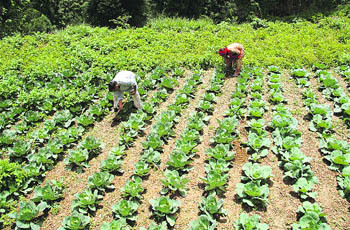 An area of 13,000 hectare has been brought under organic farming in the state. Many apple growers are also switching over to organic farming as organic produce fetches much higher prices. An Initiative has been taken to bring the entire land-locked Pangi valley in the tribal belt under organic farming. Though the weather in the Manali region is dry, New Year revellers will not be disappointed as the Solang valley, Kothi and Gulaba, popular tourist places where there were enough snow, are accessible by taxis, private cars and mini buses. Manali had become the most popular tourist spot for New Year celebrations and this would boost tourism in Kullu-Manali region. Kothi village, 12 km from here on the Manali-Rohtang Pass road, has become the biggest tourist attraction nowadays for visitors going for helicopter joyrides to enjoy the panoramic view of the Rohtang Pass, also Bhrigu ski slopes and snow-covered mountains surrounded by the Pir Panjal ranges and Dhauladhar ranges. The Simm Samm Airways in collaboration with the Helimanali is organising helicopter joyrides to boost tourism in Kullu-Manali. 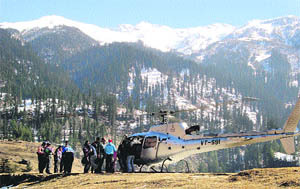 Himanshu Sharma, director, Helimanali, said a five-minute helicopter joyride up to 10,000-foot high would cost Rs 2,500 per person and a 10-minute joyride, up to 14,000-foot high taking visitors to the high Himalayan alpine areas, would cost Rs 5,000 per person. He further said a special flight of the Rohtang Pass and adjoining high mountains would cost Rs 7,500 per person. The cost of the 66-MW hydel power project being built on the Beas near Nadaun has gone up by about 20 per cent, from Rs 497 crore some time back to about Rs 600 crore now. 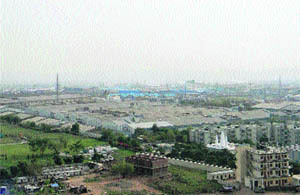 While officials with the Sutlej Jal Vidyut Nigam Limited (SJVNL), the agency executing this project, are terming the escalation of project cost due to the increase in the cost of land, environmentalists are saying the project cost was deliberately kept below Rs 500 crore to manipulate various clearances from the Centre”. The proposal for the project, which is the first hydel project in Hamirpur district, was mooted in 2002 during the last term of the BJP government in the state, but actual work on the project was started in 2009. Initially it was proposed to generate 40 MW, which was later enhanced to 66 MW. The SJVNL authorities have already been granted clearances and are waiting for final environment clearance from the Union Ministry of Forests and Environment, after which work on the project will commence. The presence of rebel Amar Chand Pal in the poll fray against Congress candidate Sanjay Awasthy marred the prospects of the party candidate. Pal played the spoilsport and secured 10,477 votes while Awasthy lost by a mere 2,075 votes after polling 15,136 votes. Govind Ram Sharma of the Bharatiya Janata Party (BJP) won from the seat on a platter. Interestingly, BJP rebel Asha Parihar could only poll 1,754 votes and the BJP suffered little damage. Arki was perhaps the lone constituency in the state where no senior state or Central Congress leader came for campaigning. Party workers and the candidate managed to put up a good fight against all odds. Awasthy improved the Congress vote share from 16.34 per cent in 2007 to 26.46 per cent in 2012. The vote share of the BJP declined from 45.7 per cent in 2007 to 30 per cent. This seat had remained a pocket borough of the Congress from 1993 to 2007. Sitting MLA DP Thakur had contested as an Independent in 2007 after the denial of ticket. This had proved to be a boon for the BJP, which won comfortably. A section of Congress workers were suspended for anti-party activities after the 2007 elections, but they were re-inducted later. This had emboldened rebels as they did not face any deterrent action. They continued their anti-party activities even in these elections. At a recent meeting, the block Congress committee had reportedly recognised black sheep in the party. A list of nine leaders, a majority of them holding official posts in the party, was sent to the Himachal Pradesh Congress Committee (HPCC) on December 22, but action was awaited against them. The list includes the names of HPCC member Prakash Karar, block Mahila Congress committee president Neelam Raghuvansi, Arki Youth Congress president Sanjay Thakur and state Mahila Congress vice-president Nirmala Devi. Interestingly, Congress rebel Pal is a former chairman of the Himachal Pradesh State Education Board. He had been appointed to the post after losingt as the party candidate in 1990. It remains to be seen what action the party takes to curtail dissidence and strengthen the party cadre by taking appropriate measures as party men are disheartened at the fallout of dissidence. Sharma said though he would have to sit in the Opposition this time, his supporters should keep full confidence in him that he had the capability to ensure allotment of their share of development and any attempt by the party in power to suppress their rights and privileges would be sternly opposed. A ‘Bilaspuri dham’ (community lunch) was also served on the occasion. Former MP Suresh Chandel, district president Baba Ranjit Singh Thakur, nagar parishad president Rajni Sharma, District Consumers Federation president Ashutosh Sharma, Mandi district committee chairman Daulat Ram Thakur, Bilaspur Sadar BDC chairman Amar Singh Thakur, district Yuva Morcha president Brij Lal Thakur, Kisan Morcha state general-secretary Subhash Thakur, Sant Ram Vaid, Prem Lal Thakur, Suresh Chaudhary, Kamal Gauttam and Ghumarwin leaders Rajebder Garga, Dr Shyam Bihari Sharma and BDC vice-president Satish Sharma were among those present. Giving this information to mediapersons here yesterday, ZSS district project coordinator Suman Kumar Minhas said the release of the budget was being awaited for the last 11 months as the honorarium payment of the staff deployed under the mission was pending. He added that this budget would now facilitate the ZSS to meet its expenditure on mission activities. He said priority would be accorded to the clearance of pending honorarium payment of master trainers and ‘pareraks’ engaged in the promotion of the campaign. Minhas said the budget would also be spent on the proposed activities of the mission so that the chief objective of the literacy mission in the district could be achieved in toto. The industrial growth that had received an impetus from the 2003 central industrial package suffered adversely with a few new industries coming up and even fewer undertaking expansion. Though a few names like Indo Rama and Nestle did initiate their ventures this year, not much could be gained in terms of sizeable employment for youth. An indication of the decline is manifested in the Value Added Tax (VAT) collections across the state whereas against the about 25 per cent growth recorded till November every year, the figures hovered around 14 per cent this year. With industry contributing a major chunk to VAT, an overall slowdown was amply reflected in the state. In the Baddi-Barotiwala-Nalagarh (BBN) industrial area, which accounts for 70 per cent of the state’s industry, VAT collections in lieu of industry saw a rise of only 16 per cent vis-à-vis last year while in the adjoining Sirmaur district this figure was as low as 2.20 per cent. Even in Kangra district, which had a sizeable number of industries, the VAT collections grew by barely 7.20 per cent. Una district has proved to be the lone exception where VAT collections have seen a growth of 21.9 per cent till November. While attributing it to the emergence of big units like Nestle, Assistant Excise and Taxation Commissioner, Una, Ujjwal Rana said factors like several units attaining optimum capacities had helped enhance VAT collections. This had also dispelled notion about the sustenance of industries after withdrawal of the central package. The situation, however, appears to be grim for the pharmaceutical industry, fast moving consumer products-based industries and engineering units, with the ever-changing tax regime reducing trade margins and leaving little allurement for a unit to sustain in Himachal. The initial 16 per cent tax exemption available to units under the central package was scaled down to 2 per cent in the current Union Budget. Since all raw materials are transported from outside and finished goods are marketed outside the state, this decline in the central excise has drastically reduced trade margins as freight charges substantially add to the production cost. Pharmaceutical units have suffered maximum on this account with nearly 25 per cent units, comprising small players, either having sold off their units or being on the lookout for buyers. These units comprise 7.14 per cent of the investors in the state and they produce nearly 50 per cent of the country’s drugs. Since the central excise exemption was available for 10 years, industrial units set up in 2003 have already availed this benefit and they were now manufacturing goods as a non-tax exempt unit while units which came into production later are still availing this benefit. This disparity has created a situation where both tax-exempt and non tax-exempt units are running in the state, thus creating an unhealthy competition. The discrimination of the Centre by allowing continuation of the central industrial package in Northeastern states while terminating it untimely in Himachal is resulting in a number of renowned pharmaceutical units shifting their high-value low-volume products to their sister concerns in Sikkim. The move has drastically reduced employment opportunities and is a major factor leading to a decline in VAT collections. The steel units that comprise 5.39 per cent of the total units have also suffered due to a decline in the construction owing to restrictions on mining of sand and gravels following the apex court directions. The unsteady power scenario, which was their major raw material, had also added to a decline in the profitability of this sector, said industry sources. The local Met office has forecast clear weather for the next four days and as such there is a little possibility of snow. As a result, the usual rush of holiday revellers is missing and the Mall and the Ridge are not much crowded. With still less than 24 hours to go for the New Year, more revellers are expected to arrive here. “There is 70 to 80 per cent booking in hotels, which is not bad. But, the usual rush of walking customers is missing. Had it snowed, the city would have been bursting at seams with the rush of tourists,” says Umesh Akre, president of the Himachal Pradesh Hotel Association. During a good season, hotels are booked to capacity and tourists have to spend nights in their vehicles. Snow during Christmas and New Year has in recent years become a rarity, but craze among the residents of plains to celebrate New Year in hill stations has been growing. They make a beeline to Shimla, Manali, Dalhousie and Dharamsala to celebrate the occasion. However, if there a good snowfall around this period, the season is prolonged by a few days. These days, people from plains do not come to the hills to experience snow, but to bask in the bright winter sun, which eludes them for weeks together due to heavy fog. In the absence of snow, winter revellers are enjoying ice skating. Clear weather is perfect for ice skating. Today, the Asia’s oldest Ice Skating Rink here has both evening and morning sessions. The district administration has divided the city into nine sectors for maintaining law and order. Over 250 police personnel have been deployed here. However, the lack of adequate parking space is causing inconvenience to the people. Several tourists complained of overcharging by the contractor near the High Court parking lot. Some even alleged that they were charged Rs 400 for a few hours. Sanjay Chauhan, Mayor of the Shimla Municipal Corporation, said there had been complaints and a few days ago a fine of Rs 10,000 was imposed on one of the contractors. He said the corporation was vigilant and it would take action in case specific instances were brought to its notice. He said he would try to get revoked the lease of land for the proposed Chogan cricket stadium, which had been given on lease in haste to the Himachal Pradesh Cricket Association by the previous government, and get the long-standing stadium constructed on a war footing. “Strengthening health services at the local 100-bedded Civil Hospital, construction of the Chogan bus stand, completion of the ongoing construction of the Mini-Secretariat building within six months, starting work on a sewerage system for the town, providing parking lots in the town, shifting the Government Senior Secondary Boys School from the Nurpur fort and providing piped water to residents twice a day are some of my top priorities,” he asserted. He claimed that he had the blessings of Chief Minister Virbhadra Singh. He said he would try to get completed the construction of Phinna Singh irrigation canal, the dream project of his late father Sat Mahajan, within next three years. He said he would ensure road connectivity, irrigation facility and government school upgrade. He thanked the electorate and Congress workers of the area. Villagers have resolved to meet Forest Minister Thakur Singh Bharmouri requesting him to repair the power supply lines in the wake ongoing snowy weather conditions. The sabha has started holding meetings in lower areas of Kangra district, demanding the elevation of newly appointed Chief Parliamentary Secretary Neeraj Bharti, MLA from Jawali, to Cabinet minister. After a meeting of the Jawali unit of the sabha at Bharmar yesterday, the Fatehpur unit held its meeting at Raja ka Talab today, which was presided over by Dilaber Singh, state vice-president of the sabha. He said such meetings had been scheduled across the state to raise the voice of OBCs. “Kangra district comprises over 60 per cent of the OBC electorate. Most of the Assembly seats have been won by the Congress due to the whole-hearted support of and mandate from OBCs. The previous government had two Cabinet ministers from among OBCs,” he said. “The present government has only given the post of Chief Parliamentary Secretary to Neeraj Bharti, who has been elected for the second consecutive time from the district. We have been passing resolutions demanding the elevation of the OBC MLA. 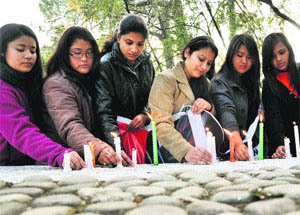 The resolutions are being submitted to the Chief Minister,” he added. Speaking to mediapersons, INTUC state vice-president Hitender Pathania appealed to Chief Minister Virbhadra Singh to investigate whether the agreements made between the affected persons and the hydropower enterprise had been implemented by the project functionaries or not. He also demanded a fact-finding report on the sanction accorded by the competent authorities of the state government for undertaking the construction work of the project. “A detailed account of the damages caused to agriculture land, grazing land, ghrats (water-mills) and graveyards due to the project should also be compiled by holding an official probe,” Pathania said. Supporting the cause of the affected people residing in and around the project site, he said INTUC office-bearers would also meet the Chief Minister on the issue soon. Pathania hoped that the Chief Minister would provide justice to the persons affected by the project. The body was identified as that of Jagdish Kumar, a truck operator and resident of Dobha village under the Barmana police station. He had been missing for many days. Reports said Jagdish’s wife Indira Devi lodged a first information report some days back that two persons had purchased a truck from her husband, but had stopped paying loan instalments at the bank. When he had insisted on payment, he had been threatened, she reported, further saying her husband had telephoned her that nobody should search for him. The police reportedly recovered a suicide note. It registered a case and started an investigation. The council elected Narender Guleria its vice-chairman. He defeated Vipin Pandit by three votes. The council has around 10,000 members.